The printable alphabet flashcards below are going to help your child learn their letters in no time. The best part is that these printable alphabet flashcards are all free! These are some great looking flashcard sets with wonderful illustrations. They range in style from modern to vintage, but they all are clear and easy to understand. They'll provide your child with lots of fun and start them off on the right foot with love for learning. These printable alphabet flash cards work best when printed on card stock. They'll last even longer if you can laminate them. If you don't have a laminator 404, check with your local school and library to see if they have one you can use for free. Your child will also love these color by numbers and connect the dot worksheets. Mr. Printable has a set of free alphabet flash cards that have simple, colorful images along with the name of the image, and the uppercase and lowercase letters. These print out four flashcards per page and even have cut lines to help you neatly cut them apart before using. Here are two sets of free, printable alphabet flashcards that includes real images and cartoon images. There are a ton of other free alphabet resources here including alphabet sheets, consonant and vowel cards, tracing sheets, and even wall posters. These open as a PDF file and can print eight flashcards per page. Your little ones will love these adorable alphabet flashcards with the colorful watercolor illustrations and the slight grunge that gives them a lovely vintage look. These print four flashcards per page and work best when printed on card stock. Included in this PDF download are printable alphabet flash cards in manuscript and cursive, as well as number flashcards. They come in two different sizes of flash cards as well, making the larger size perfect for hanging on the wall. This is a fabulous printable alphabet flashcard set that has an uppercase, lowercase, picture, and word on each flash card. These illustrations are adorable and make a great keepsake. They print four flashcards per page and can be printed as a PDF or image. Here's a PDF file of printable alphabet flash cards by ABC Teach. All the alphabet flashcards include the uppercase and lowercase letter, an image, and the name of the image. You'll need to register for a free account before you're able to print these, and they print out 6 per page. If you're a fan of the LeapFrog educational DVDs, then you're going to love these free printable alphabet flash cards that were designed to match the characters. You can print the already colored cards or print them in black and white so your little one can add their own flair. 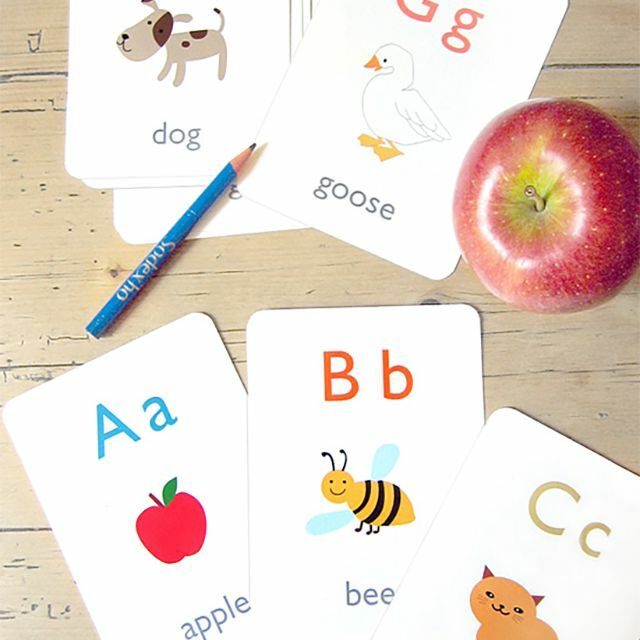 These are simple printable alphabet flashcards that are just right for a child just learning his letters. Each card has the uppercase letter and a colorful frame. Besides having the free, printable alphabet flashcards, they also give you 25 ideas on how to use them. These are meant to be decorations, which they look wonderful as, but they would also make wonderful alphabet flashcards. These flashcards have lowercase letters as well as a word and image on them. They're unique images which are a great break from the standard photos you find on all the other flashcards. These printable alphabet flashcards over at Sweetly Scrapped have a lovely vintage look to them. Vintage clip art images go along with the uppercase and corresponding lowercase letter. You can print these as a whole set or individually. There's also a blank flashcard if you'd like to come up with some of your own. Any young child would love these colorful alphabet flash cards designed by Aimee Aeroux. They each have the uppercase letter, lowercase letter, illustration, and sentence. Download the free PDF and print these four flashcards per page.